With the news that Texas Governor Greg Abbott is about to sign HB40, a “ban of bans” that will prohibit local communities in that state from enacting oil and gas drilling ordinances, it’s exciting to see that the fight hasn’t gone out of local organizers of the Denton ban campaign. The documentary tells the empowering story of how an exploited but tenacious and creative town managed to upstage the oil and gas industry deep in the heart of Texas with the power of music and community organizing. Together and against all odds they won the very first ban on hydraulic fracturing in the state right on top of the same shale where fracking was first invented. What the oil and gas industry has done in response is to push a bill making community control illegal, and that is the bill that sits on Governor Abbott’s desk. Meanwhile, the Rockwall County Herald Banner, a newspaper based just east of Dallas, has clearly articulated what is wrong with this bill. The paper ran this editorial in Sunday’s paper, and I print it here in its entirety for your review. Like Denton, Rockwall County is not a liberal hotbed. Its voters send Republicans to represent them in the legislature. But the editorial recognizes the danger of removing local control over how oil and gas drilling takes place in individual communities, and the hypocrisy of taking away individual rights to appease the oil and gas industry. These are lessons we should take to heart in Montana and specifically along the Beartooth Front, where local zoning is essential to preserving the long-term economic, environmental and cultural health of our communities. The bill that sits on Governor Abbott’s desk comes out of the oil and gas industry’s national playbook, and a nearly identical bill will likely be sitting on Governor Bullock’s desk in 2017. The Texas Legislature has sent a bill to Gov. Greg Abbott’s desk that would keep cities from banning hydraulic fracturing, commonly known as fracking. The legislation, which received significant support from the oil and gas industry, prohibits cities from enacting bans on oil and gas operations within their cities limits or extraterritorial jurisdictions. It sets a dangerous precedent, enhancing state power while limiting the power of a municipality to control what happens within its own borders, which also reduces the level of control local residents have over what occurs in their backyards. Fracking is already a controversial issue, with detractors claiming it contaminates ground water and leads to an increase in seismic activity. Water is already a precious commodity in Texas, and giving oil and gas companies free reign to potentially pollute it does not sound like a good idea. Regardless of how significant an impact fracking has on the environment, local municipal leaders should be able to decide whether they want to allow fracking in their city. Local control should not be taken away by the federal or state government except in extreme situations when it is absolutely necessary. This situation definitely does not meet that criteria. The state of Texas is built upon the concept of home rule, which empowers local municipalities with more than 5,000 residents to make their own decisions, rather than have all of their actions dictated by the state government. Smaller governmental bodies are more receptive to input from local citizens, granting more control to those citizens. Removing this control in order for oil and gas companies to be able to make more money is not what our legislators should be concerned about. Access to reserves of energy is important, of course, but it is an important enough decision for municipal governments to make on their own, without the state telling them what to do. Conservative legislators have triumphed smaller government and criticized the federal government for overstepping its bounds by compelling the state to accept legislation, such as the Affordable Care Act. These same legislators are willing to pass a bill that would strip municipal governments of control within their own city limits. Ideologically, it does not make any sense, unless you factor in the deep pockets and significant political influence of oil and gas companies. Engaging in fracking in Texans’ backyards is a privilege, not a right, and a privilege that should be granted by the people who are going to be enduring the possible effects of such behavior, not those who profit from it. We’ve been writing about Denton for several months. It’s an important story from the standpoint of community organizing, but also very useful in understanding the power of the oil and gas industry to push legislation that challenges the ability of local communities to control the terms of economic development on their own land. This is a lesson we should heed in our work along the Beartooth Front. 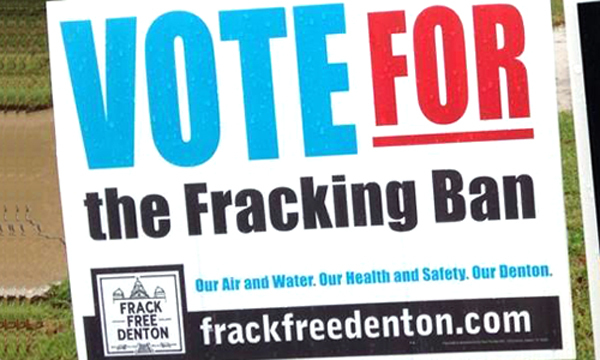 This entry was posted in Community Organization and tagged ban of bans, Denton Texas, documentary, Don't Frack with Denton, fracking ban, HB40, Texas, video. Bookmark the permalink.